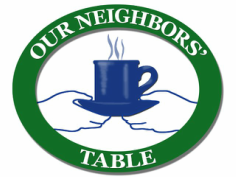 Thank you to all who supported Our Neighbors' Table's Annual Breakfast on October 23, 2018! This year's Breakfast was an inspiring morning celebrating the collective impact of the community joining together to create food security. Emceed by Dana Marshall at the Blue Ocean Event Center, the theme of the Breakfast was "Food Security Starts With You." Dr. Gail Fayre of Anna Jacques Hospital, volunteer Bob Murciak and board member Kellyn Nahas bravely shared their own stories with the group. Thanks to the generosity of the attendees and sponsors, over $26,000 was raised at the Breakfast, which will provide 40 people with 3 meals a day for an whole year! Congratulations to our 2018 Community Champions! 1 in 16 people in our region is struggling from hunger - 1 out of 5 seniors and 1 out of every 8 children. ONT's programs are available to all residents of 12 cities and towns, from Groveland to Newbury, Salisbury to Boxford. We're putting local resources to good use! Individuals and local businesses account for more nearly 60% of our budget. For every $1 of your gift we spend on food, we are able to leverage more than $5 in no-cost food donations. ONT's programs rely on more than 300 hours of volunteer service each week. For every 1 hour of paid staff time, volunteers contribute 2 to 3 hours of service to help run our programs. Taking our programs on the road with your help! Did you know ONT already operates food pantry program locations across Amesbury, Merrimac, Groveland, and Newburyport? Over the next five years, ONT will work to ensure that people in need in every one of the 12 cities and towns we serve has real access to quality food when they need it.